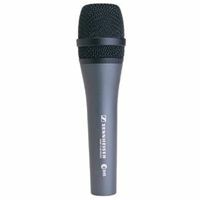 The Sennheiser e845 is one of our favourite vocal mics for live band and church use.Competing well against the Shure Beta58a and yet at a much better price point. Available in switched or unswitched versions. The E 845 is a high output performance microphone, offering power, clarity and projection. It has extended high frequency response and supercardioid pick-up pattern for higher signal output, cuts through high on-stage sound levels. Smooth warm tonal response and full dynamic range, with presence lift for vocal clarity and projection. Consistent on/off axis and proximity response maintain sound quality while moving, providing greater on-stage freedom.